When the Kit Yamoyo trial ended, in Sep-13, we incorporated all the learning into a re-design of the Kit Yamoyo product. This process aimed to drive out the price subsidy we had to use during the trial, without compromising on the functionality we had found to be so important: specifically, the small ORS sachet size of 200mL and the key benefit of the clever packaging: to act as a measure for the water needed to mix the ORS. This re-design process is described here. This process resulted in 2 designs: the flexi-pack and the screw-top. Although the screw-top was locally produced and is a much better, measuring, mixing and storage device, it was put to one side on cost grounds. However, we did commission a mould and a small batch were produced by the Zambian company, Polymer Containers, who generously donated the mould to the project. It was the flexi-pack that went forward as the scale-up design. 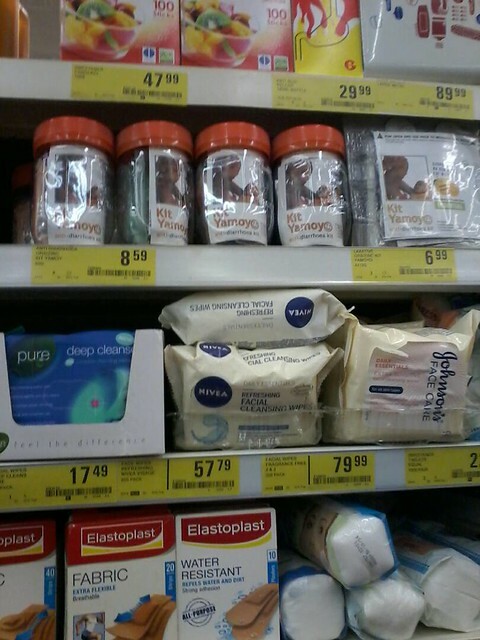 Then the Zambia Revenue Authority ruled that the flexi-pack was VAT-able as it contained soap – this is documented here. This added 16% to the retail price. The Kit Yamoyo manufacturer’s response to this was to rush out a version of the flexi-pack without soap. This was called ‘Kit Yamoyo ESSENTIAL’. 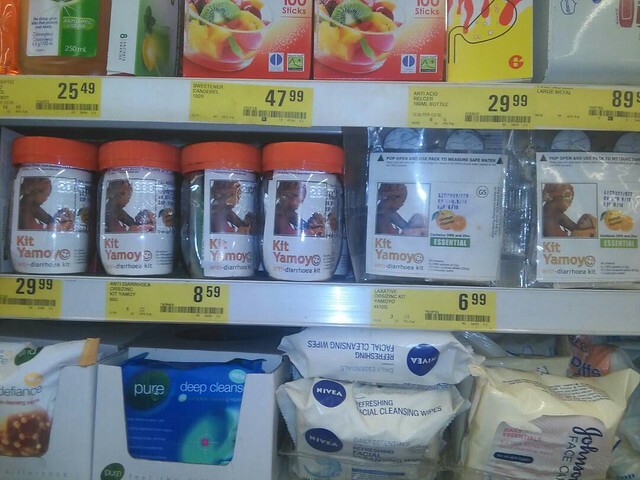 For several months the original Kit Yamoyo (with soap) sat next to the new Kit Yamoyo ESSENTIAL on shop shelves, both in the same flexi-pack. Both looked very similar but one was a lot more expensive due to the cost of the soap it contained and the VAT this soap attracted. 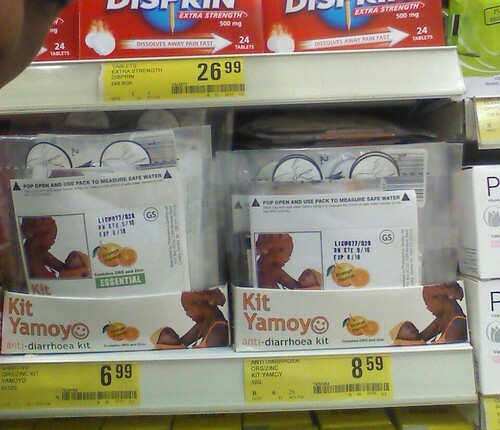 Sales of the “original” Kit Yamoyo began to fall. Kit Yamoyo ESSENTIAL alongside the original Kit Yamoyo. Looking very similar but with very different price tags. At the time Kit Yamoyo ESSENTIAL was launched, we’d decided, co-incidentally, to order some Kit Yamoyo screw-top jars to be used, empty, as promotional items at marketing events. It took a while for these screw-tops to be produced and by the time they were available the fall in sales of the original Kit Yamoyo was becoming very evident. So, at the end of January this year (Jan-17) when we met with our manufacturing partner, Pharmanova, we all decided to divert the screw-tops from promotional use to production. We’d upgrade the original Kit Yamoyo (with soap) by putting it in the screw-top. We were delighted when Shoprite, Zambia’s biggest supermarket chain, agreed to take the new format. The Kit Yamoyo original, in the new screw-top packaging, now looks like it can command a higher price. Pharmanova have been able to upgrade the packaging in this way without increasing the ex-factory cost of the new ‘Kit Yamoyo’ as ColaLife has covered the cost of the screw-top packaging for the first 8,000 kits. Pharmanova will now have to decide what the unsubsidised price should be, once the sales go past 8,000. It will be very interesting to see what happens. Will sales of the original start to rise again, now it has the premium packaging? Will care-givers buy one Kit Yamoyo Screw-top and then buy the ESSENTIAL flexi-pack as a refill?